Birmingham Public Library’s (BPL) Southern History Department recently completed a month-long series of after-school programs at Birmingham City Hudson Middle and Green Acres Middle schools. The programs were part of the Birmingham Cultural Alliance Partnership (BCAP) headed by the Birmingham Civil Rights Institute (BCRI). BCAP seeks to provide quality after-school programming by connecting local cultural institutions such as BPL, the Birmingham Museum of Art, the McWane Science Center, and the Birmingham Botanical Gardens with local middle school students. BPL has been a BCAP partner since its inception in 2000. BCAP has been called a “model after-school program” and in 2006 received the President’s “Coming Up Taller” award. Southern History’s programs were designed to expose the students to the importance and basic techniques of genealogy and family history, which involved discussions on the story behind their names and nicknames and family traditions, interacting with historical resources such as local school yearbooks and newspaper microfilm, and receiving a copy of the front page of the newspaper on the day they were born. Guest presenters spoke on various aspects of genealogy and history and included Dr. Larry Spruill of Morehouse College, Isaac Prentice of the Alabama Buffalo Soldiers, and members of the Birmingham African American Genealogy Study Group. 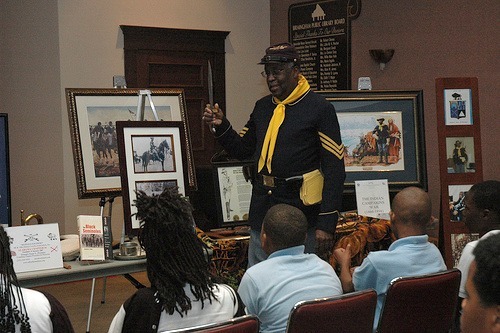 In all, Southern History conducted 10 programs to over 240 participants. “It was a real treat getting to know these students,” said Southern History staffer Beth Willauer. “They are scary smart and leading discussions and having them to open up about their family traditions was a delight. We are delighted to see the students in the library after the formal programs wraps up and we look forward to continuing the partnership in the future.